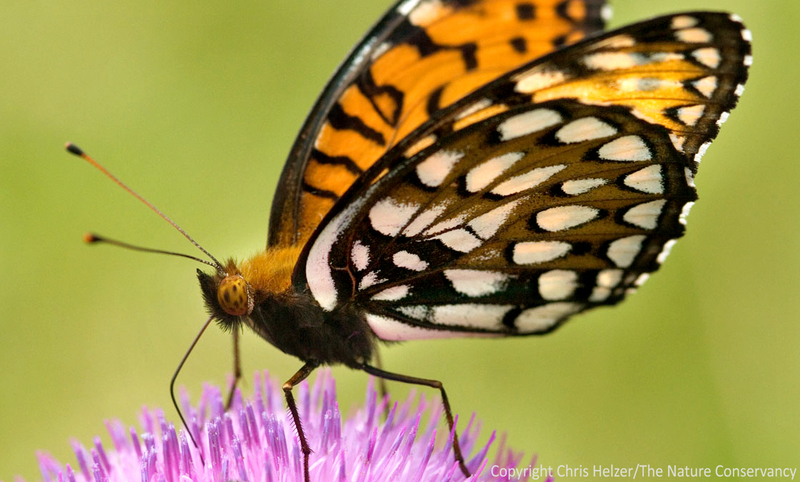 We’ve been conducting field surveys of regal fritillary butterflies for the last three years. During that time, we’ve learned a lot about how those butterflies are responding our prairie management and restoration work. So far, there are two overwhelming lessons we’ve learned from our work. 1. The number of regal fritillaries produced in our Platte River Prairies is primarily tied to two factors: violets and thatch. During the spring, when adults are first emerging from their chrysalises, butterfly abundance is highest in degraded remnant (unplowed) prairies that have few showy native wildflower species, but lots of common blue violets (Viola sororia). While they don’t have much to excite a prairie botanist, these prairies sure produce a lot of regal fritillaries. We don’t find many regals in recently burned portions of these prairies – only in portions that have built up some thatch. A regal fritillary feeds on a thistle – The Nature Conservancy’s Platte River Prairies, Nebraska. 2. After regals emerge and mate in those thatchy violet-rich prairies, they spread out into more flowery sites to feed. In our Platte River Prairies, those feeding sites tend to be restored (reconstructed) prairies located around and between those degraded remnants. Those restored prairies have significantly fewer violets than remnant prairies, but lots of the favorite nectar flowers for regals, including hoary vervain (Verbena stricta), milkweeds (Asclepias spp. ), wild bergamot (Monarda fistulosa), and thistles (Cirsium and Carduus spp.). Interestingly, while we don’t see regals emerging from recently burned prairie, some of the most-used summer nectaring sites are our most recently burned sites.